(l-r) Lieutenant Curt Andrews, a North Haven volunteer firefighter and State Representative Dave Yaccarino. House Bill 5125 AN ACT INCREASING THE PROPERTY TAX ABATEMENT FOR CERTAIN FIRST RESPONDERS. “Finding and retaining volunteer firefighters is a very difficult process and this bill seeks to offer an incentive to assist our communities to ensure the safety of our residents. These men and women provide a valuable service to all of our communities,” said Rep. Yaccarino. “I firmly believe that anything we can do to provide some level of financial assistance to offset the hundreds of hours required for training and emergency responses will pay huge dividends in the future for each and every town in Connecticut,” said Lieutenant Curt Andrews who has been a volunteer firefighter in North Haven since 1986. 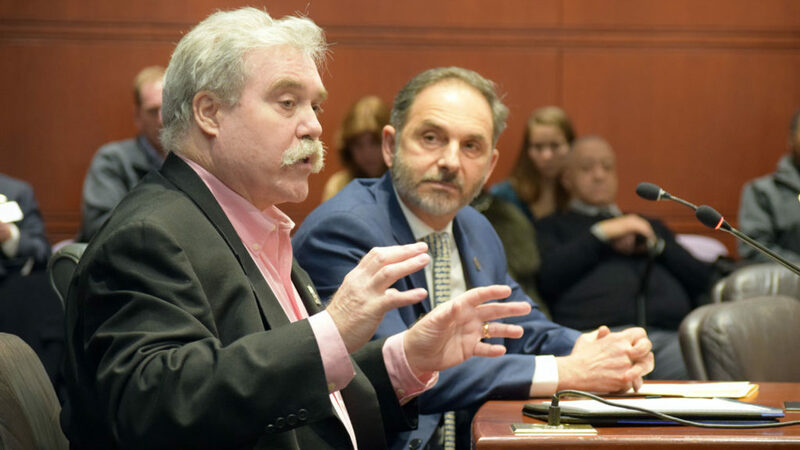 This legislative session, Rep. Yaccarino submitted a similar proposal, House Bill 6124, which would permit municipalities to increase the amount of property tax abatement to up to $3,000 for certain first responders. Both bills await further action in the Planning and Development Committee. Rep. Yaccarino can be reached by phone at 1(800) 842-1423 or by email for questions and concerns regarding state government.